Life is out there, and one pilot's impressive detective work is helping us find it. Are we alone in the universe? Life's great mysteries can lead people to do some pretty crazy things. 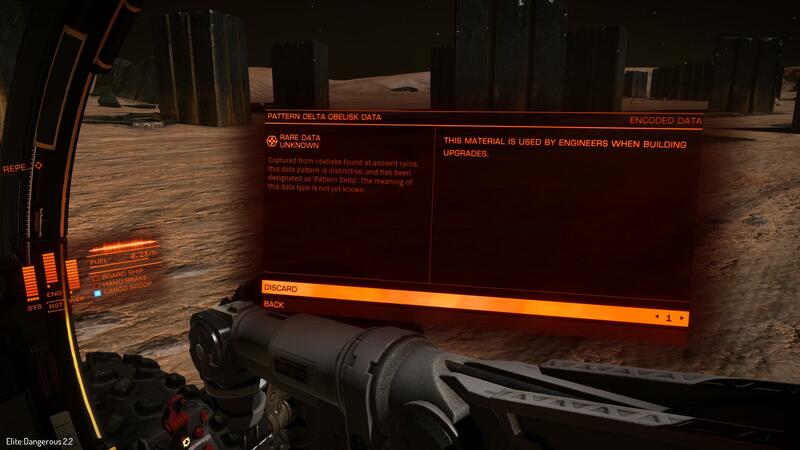 For example, one savvy Elite: Dangerous pilot picked up on incredibly obscure details in a recent trailer to discover a hidden planet containing a stash of alien artifacts unlike anything the community has seen before. Neil deGrasse Tyson would be proud. The discovery comes on the heels of Elite: Dangerous' The Guardians trailer, which teased players with some brief shots of glowing alien artifacts—something that Frontier Developments was hoping would take its community quite awhile to find. Unfortunately for them, CMDR xdeath proved too clever for Frontier's tricks. Aliens have been a hot topic in the Elite: Dangerous community for a good while now. The search for life first began a year ago when update 1.2 teased "mysterious artifacts," leading players to discover strange canisters that emit odd, warped noises. Since then, others have discovered probes that disable your ship and talk to you as well as creepy space barnacles jutting out of planet surfaces. Xdeath's discovery, however, is probably one of the biggest to date—like, Area 51 big. In the final scene of The Guardians trailer showing off an alien relic, xdeath noted a nearby planet and some recognizable star clusters and nebulae. "I triangulated the position of the system using the position of Andromeda, Pleiades Nebula, Phakt and Epsilon Columbae, as they were seen in the trailer," xdeath writes in a Reddit thread. From there, he compared the craters of the planet as seen in the trailer to others nearby until he had a positive match and then began scouring the surface for sign of the artifacts. What he found is likely one of the largest alien formations seen in Elite: Dangerous to date. Another player, CMDR Josh Hawkins was one of the first on the scene and quickly uploaded a video to YouTube of the alien site, which you can watch above. Among them are many relics that the community has never seen before. So far, the community is still puzzling over what these objects could be. An item called "rare data" can be obtained from alien obelisks at the site and has an in-game description that suggests it can be "used by engineers when building upgrades." But no one has figured out how to put it to use as of yet. Another theory suggests that there might be something hidden inside the glowing blue fragments taken from the alien relics. Players used the free-roaming developer camera to clip into the object, revealing what appears to be an inner chamber. Another player clipped through the planet's surface to also reveal a strange object turning around an axis like the hands of a clock. I'm hoping Elite: Dangerous' obsession with aliens leads to something worth all the effort. The common belief is that these relics point to this existence of Thargoids, an alien race from the first Elite. They're known to be rather violent, however, so maybe we shouldn't be actively hunting them down? I mean, that'd be the sensible thing to do, right?